Can't say how much a fan Gerry and I are of outerwear we have for Jakey, through Canada Pooch. Jakey has no undercoat so is always cold. Once the weather turns, he has a hoodie and a winter coat for colder weather. He had another rain jacket from another company but we have honestly found it too thin and more of a windbreaker than a rain coat that he needs. Although he hates to get wet, he still enjoys going out for his "routine walks". He just doesnt always realize it's raining or sprinkling til he gets outside! We wanted to have something for him that would keep him warm AND dry and he loves his new Canada Pooch Torrential Tracker Jacket. If I would have to promote one brand whole heartedly, it would be Canada Pooch for doggie clothing. They are truly #1. 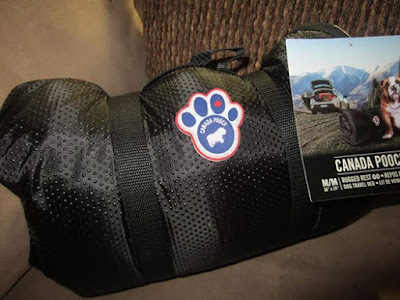 Although Canada Pooch sells high quality and functional pet outerwear, they also sell accessories and travel beds...which Erika had "Be" review for us. Erika says : "Be" loves her new Rugged Rest "Go" Travel Bed from Canada Pooch!! It has a dig, chew & water resistant shell while still being comfortable. The bed also includes a non-slip bottom, perfect for our vehicle. The material is also easy to clean and the bed itself has a velcro roll up feature for easy storage. 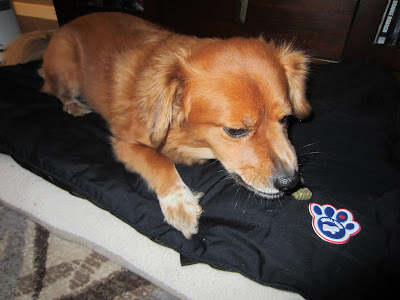 The Rugged Rest "Go" Travel Bed is a must for any dog who loves to travel and Be loves even using it in our condo, when we're not on the road traveling to visit family! I love the coat, Izzy has a winter coat fro them a downfill and it's awesome! yes, very nice clothing they have.